This month, the Daring Bakers tried our hands at making a laminated dough. Hosts Kelly of Sass & Veracity and Ben of What’s Cooking? chose a recipe for a Danish braid from Sherry Yard’s book The Secrets of Baking. While I can’t say that I ever feel the urge to have a Danish, I do appreciate tasty homemade breakfast treats, so I was looking forward to this challenge. 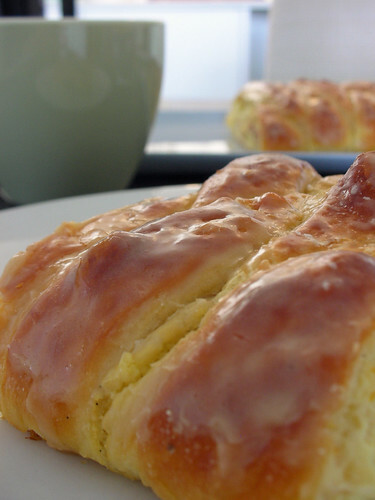 Like its sisters, puff pastry and croissant, a Danish is made from a butter-laminated, or layered, dough. This means a block of butter is encased in dough and repeatedly rolled and folded to create layers. Danish dough is sweet and contains a bit of yeast to help it rise (it also makes it a bit more bready than puff or croissant). While this type of dough may initially seem intimidating, it’s not hard to make in small quantities, and Danish dough is a good introduction to the laminating process. The dough is flavored with cardamom, vanilla and orange. While the cardamom and vanilla were must-have flavors for me, I found the orange to be a bit too pronouned. If I made it again, I’d probably leave out the zest and use only the orange juice. We were allowed to choose our own filling, and I made mine with a center of sweetened quark cheese and cherries. It was great, but I was worried about having a runny filling so I was a little skimpy with the cherries. I wish I’d been a bit more liberal with them. Just about all sweet breakfast pastries should have an icing sugar glaze in my opinion, so I was liberal with that! The full recipe provided by Kelly and Ben made two braids. I didn’t need that much, so I halved it to make just one. It was beautiful, and big enough for six quite healthy portions. And braiding dough is way easier than braiding hair, let me tell you. If I’d thought about it enough, maybe I would have made a smaller braid and saved aside some dough for other fun shapes like pinwheels…another time. If you’d like to test your laminating and braiding skills, you can find the recipe in Kelly’s post or Ben’s post. And no need to worry if, even after you look at the zillions of braids on the DB Blogroll, you still feel nervous about trying it yourself. Kelly and Ben also pointed out a great video clip from Julia Child’s Baking with Julia series on PBS. This clip demos a different recipe by Beatrice Ojakangas, but the technique is very similar. lovely Steph! I would’ve used cherries too but I don’t have a pitter sadly. It’s one of those instruments on my wishlist, along with an ice cream maker. We still have the 28th :-), we found the cardamom a bit overdone … A quark cheese and cherry filling sounds devine! I agree, laminated doughs are easy to make only time- consuming. The filling you used sounds wonderful, oh how I wish I could get quark here. That glaze looks scrumptious too. Beautifully done! I want to taste it. It really looks great. Beautifully done. I would liked to see more cherries too, but its perfect. It’s beautiful! Wish I had a piece right now. Your braid looks fabulous! The glaze on top looks beautiful and delicious! Lovely braid. I love cherry pastries, but cherries are soooo expensive. I don’t know why they don’t just plant more trees. When you make single Danishes you could pile on heaps of cherries. Quark cheese is fantastic and I love the glaze on the top of your braid. It”s really gorgeous. Good job! Looks fantastic Steph. I haven’t been able to make it this month. But I hope to try it soon. Cheery and cheese sounds so good! Mmm quark cheese…I bet that was tasty. Your braid looks lovely. Looks gorgeous and your filling sounds amazing!!! That braid looks just lovely Steph! Great Job! I did a cherry one and it seems to be a very fine balance of getting enough on there for a good cherry flavor, but not so much that you get cracked ribs as I did! I agree that the orange was a bit too much, but didn’t mind the cardamom. Nice job! your filling sounds so good! could yours LOOK more perfect? Seriously?? Your braid is so gorgeous I want to reach into the screen and break off a piece! I’m not familiar with quark cheese, but your braid looks awesome. I wasn’t expecting my Danish Braid to be more bready than flaky, but I see why now from what you wrote in your post: thanks! Looks great! I wish I had been more generous with the filling as well – live and learn. Congrats on a job well done. mmmm! It looks delicious! I would have preferred to have more of the orange flavor in mine. The cardamom was just too pronounced for me. Quark cheese and cherries sounds so tasty! Great job! That glaze looks super tasty! Looks great! I agree on the orange zest…it was a bit overpowering. Steph, your braid looks lovely and cherry and cheese is one of my favourite danish fillings! I love that you used quark! Did you add any egg to it at all? Or was it fine on its own? Mmmm. Looks as good as it sounds! Gorgeous. Great minds think alike – I used cherries also. Looking goos Steph, well done! Fantastic job! I’m still trying to get mine made – ugh! I’m a slacker this month! As usual, beautiful photos of your lovely creations! 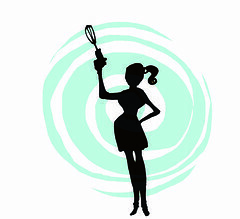 I really like the glaze that you used, too – did you use confectioner’s sugar in it? I know the recipe can seem intimidating but after the first roll it gets really easy :-p Great job in this challenge. Your pictures make me want to have breakfast all over again! Great job and lovely photographs! 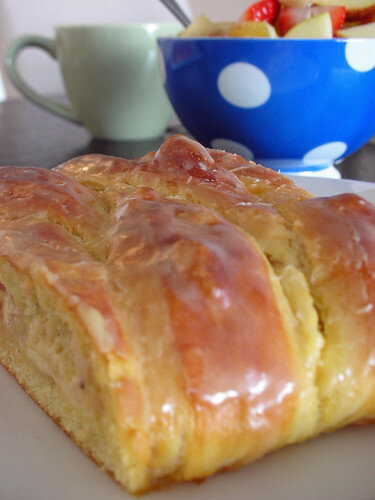 Cherries and cheese sound delicious in this danish. I love that you always do a half recipe. I need to learn that! I feel like I’ve been eating Danishes all day…I guess I did for 2 meals at least! The glaze on your danish looks amazing. mmmm how fabulous, quark and cherries, that sounds so delicious. good to know that you would use more cherries next time. your pictures look perfect too ! Beautiful, beautiful braid! Great job!!! Your danish looks perfect! I’m so sad about my cherry version, I’d be tempted to do it over again this weekend, if we weren’t off to the UK. Next go round, I’ll definitely glaze mine! that looks lovely. could you please share how you made the iceing for the top? Of all the attempts at this recipe, I prefer yours and I haven’t even tasted it. Must have been heaven!!!!!! Cherries sound like a great filling, and I like the glaze. that looks delicious. I could use a slice with my coffee this mornign. Wow, that filling combo sounds scrumptious! Your finished product looks like a magazine photo, gorgeous! Beautiful braid! And quark cheese and cherries sound perfect! Oh yum, that looks great. I like your combo of fillings and the oozy picture is sooo tempting. 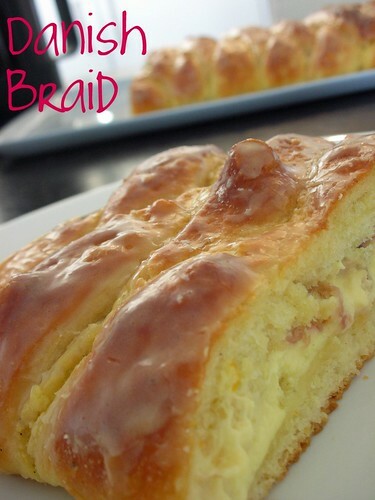 I wish I had glazed my sweet braid the way you did – I agree it makes the pastry 🙂 Awesome job on this month’s challenge! the icing glaze, oh the icing glaze!! your braid just looks absolutely decadently delish with that glaze! I’m like you… I love cherries! Bring ’em on! Those are absolute perfection. YOur flavors sound yummy as well. I agree – the glaze is a must! Beautiful braid! GREAT job! I’m with you on the glaze on top! Ah a glaze! That’s what mine was missing. Your braid looks amazing. Your braid is beautiful the dough looks really yummy and raised well. looks light and delicious. great job! Beautiful braid, and cherries sound divine! This looks beautiful..and as always your photo’s too! Nice touch, with the icing on top, though it’ll probably be more of an afternoon tea treat because of all that glorious sugaaaar. I loaded mine with cherries and while a little juice did seep out, it caramelised beautifully and didn’t really cause any problems. Drool… your braid sounds awesome! Nice job! It’s so beautiful! I love your icing! Nice braid – and I like the fact that used a glaze on top. this looks incredible! well done! Oh, that filling sounds so good! Your braid looks beautiful. Now I’m wishing I had thrown a glaze on my braid, too. Yours looks s good! Your pictures made me drool! I wish I would have had a glaze for my braid! Great job. Your choice of quark and cherries as filling is awesome! I bet t was a tasty braid!